My daughter was way over due for a new bed set. I was worried about this being so cheaply made. Now it is on the thinner side of material - but once we put it all together it looks nice on her bed. Nestle in clouds with the Urban Habitat Kids Bliss Duvet Cover Set. 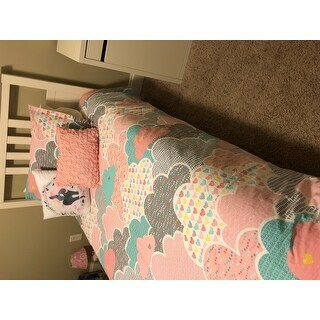 The duvet cover showcases various cute and fluffy clouds in a colorful palette of pink, aqua, and white. Within each cloud is a playful design that adds extra charm and dimension. The duvet cover reverses to a solid, soft pink. One pillow features all over ruching and the other features an embroidered unicorn. Made from 100% pre-washed, pre-shrunk cotton, this duvet cover set is hypoallergenic and bed-ready right out of the package. 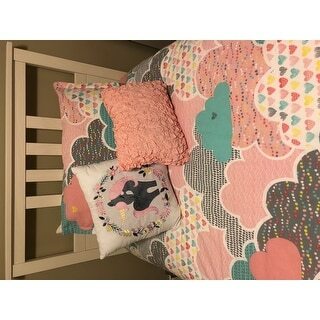 Duvet cover, sham & decorative pillow are absolutely gorgeous & my daughter just loves it!! I’m so very pleased with this purchase! A very soft duvet cover set. I ordered this for my 3 year old and she loves the extra pillows and also that this is so soft. I love it!! And the best part - My doughter LOVES it!!! It’s 100% cotton, I washed it with some fabric softener and it’s perfect. My daughter also loved the other Urban Habitat Unicorn set - Kids Ella Purple. So we got that one as well and combined the pillows. The collors are super fresh and go nicely together. This bedding is beautiful! It is actually much brighter in person than what the pictures show. Doesn’t fade with washing/drying. The pillow sham is very soft unlike other shams. The only downfall is the pillows are spot clean only. The colors and quality are just perfect. I love the decorative pillows that come with this set as well. Great quality, great price for what you get. Decorative pillows are a good size and feel good. I absolutely love the colors. Looks so cute with white furniture. Very pretty! The material is a soft cotton that washes well, and the colors are true to the photo. Looks and feels great on my daughter's bed! Great quality and fair priced! 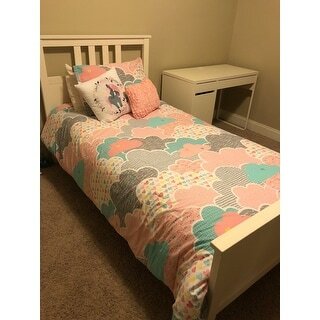 It if perfect for my 2 1/2 year old and her first big girl bed! I would by this brand again! "Does this have button or zipper on the duvet?" This duvet has buttons and inner ties.